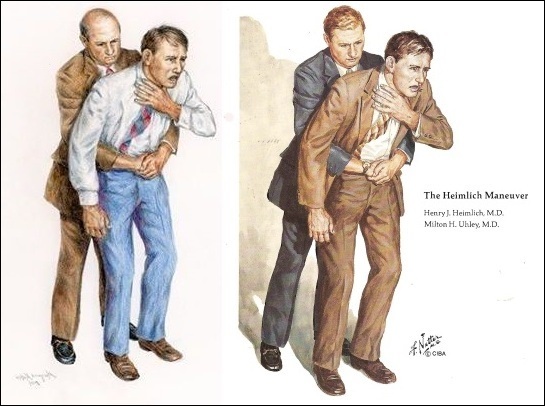 Per my previous four items in this series, a July Kickstarter campaign raised about $32,000 to fund The Maneuver: The Inside Story of Dr. Henry Heimlich, a proposed documentary film about my father's life and career. Jason Schmidt is a freelance film editor based in New York City who's hoping to make his directorial debut with the project. Recently I e-mailed Mr. Schmidt a handful of fair questions regarding false and/or dubious claims in the Kickstarter campaign, and if he intended to inform the 298 donors who funded his project. He refused to answer any of my questions. Briefly, the Kickstarter fund raising page included the false claim that actress Halle Berry was saved from choking by "the Heimlich" -- she denied it in a recent Hollywood Reporter expose -- and other questionable claims that suggest the filmmakers may not have a basic grasp of the material. Then there's an "original retro-style artwork" by South Carolina artist Margaret Mattox that was offered as a premium to donors. On the left is Ms. Mattox's artwork, flipped horizontally. On the right is a copyrighted 1979 illustration by the late Frank Netter MD.